What Felts Will Not Fall Off Chair Legs? Whether you have hardwood, tile, bamboo or other hard flooring, scratches are always going to be one of your biggest concerns. It’s not as much tables but with chairs being routinely moved across the room, you’ve got to be worried about scratches and gouges in the flooring. Because chairs tend to scratch and wear down the finish on hardwood and other floors, chair leg pads are a must. While floor protectors, or glides, come in a variety of materials such as rubber, cork, plastic, felt is universally suited to all hard floor types. Rubber and plastic can scuff, and lower quality cork tends to break down sooner. 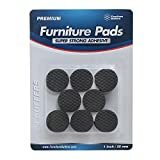 Felt pads for chair legs are the best option for all hard floors (not just wood but tile, laminate, marble, vinyl, etc.). 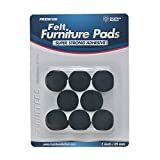 Felt protectors provide cushioning with a soft material that glides fairly easily (though not as well as sliders). There are a few types of felt pads for chairs, and they vary in price and application. Nail-ons stay put for a while, but can cause a lot of damage to floors if not installed properly (as can be seen in Amazon reviews – one woman’s floors were completely etched into by a nail). Unless you’re aiming for something very specific, self-adhesive pieces are a better option — and now that you know that, the trick is finding ones that won’t fall off. The best choice for chair leg floor protectors that actually stick are the highly-rated Furniture Buffers. Inferior brands appear to be thick and sticky up front but quickly deteriorate into a fuzzy mess and peel and come off but the miracles described below will not fall off. In contrast, Furniture Buffers are thick and dense, and soft enough for the any finicky floors. Best of all, they come with the stickiest self-adhesive in the industry, often referred to as “sticky as syrup”. No other variety pack packs this much punch. Most are simply 3 different sizes with 75% of the container being the standard 1 inch pads. However, with The Jumbo, if you were to buy each of these sizes individually, it would add up to $57.88! Keep in mind, The Jumbo is only $19.99 right now so it’s a really good deal. Buy now and invest in economical, high-quality felt floor protectors, and keep your floors looking beautiful and undamaged for years to come. Trying to keep your lighter furniture from moving? Take a look at Furniture Buffers non slip line here. They’re sleek, light weight, and provide just enough give vs. straight rubber. Go back to our homepage to learn more about protecting the valuable property that rests inside your home.